It’s not common knowledge that Cisco Press publish errata on their website that list the errors in their textbooks. And especially the more complicated textbooks, its reasonably easy for mistakes to get introduced between the author, reviewer and editor and the publishing process. Cisco Press regularly publish Errata on their websites that contain the mistakes that the authors have identified and corrected and you can download them. Errata are released dependent on the printing run and the edition of the book, so sometimes you will need to check carefully to determine that you are downloading the right version of the errata. Etherealmind Note: They are in Word DOC format. WHY!? What’s wrong with Rich Text Format that can be read by all text editors. MS Word is a classed security risk for some companies (and blocked), and is a formatting nightmare on many computers to boot. Bah, idiot publishers. It’s not entirely obvious, in my opinion, so here is a nice picture for Cisco Press CCIE Routing and Switching Exam Certification Guide, 4th Edition showing you the two step process. 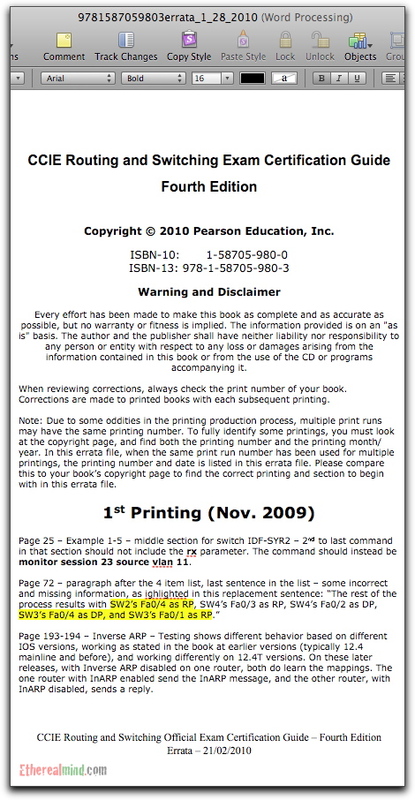 Note that the ISBN number is clearly indicated at the top of the document. Make sure that you double check this number to confirm that you have the right version of the errata. It is also worth checking back every two or three months to see if the errata have been updated even further. I have to say that Cisco Press textbooks do not contain many errors and there isn’t much that can be done to stop errors creeping in. Be happy that the errata are published and easily available (even if the Cisco Press website is an shockingly bad piece of design, you would think a publishing company could do better eh ? ). I never noticed that. Double funny! An old post, i konw, but i just had to share my latest experience about Cisco Press. I lost my confident in this book. Where should one find motivation to continue to read a book and try to learn all the details when you know that are a big chance that some of it i wrong?